Pam Turner is a highly lauded juvenile nonfiction writer, often garnering starred reviews for her work. She also won the Golden Kite Award, one of the most prestigious honors for a writer, because it’s awarded by one’s peers in the Society of Children’s Book Writers and Illustrators. Ms. Turner focuses on science and nature, bringing those topics alive for readers of all ages. Her books also present important environmental and social topics as she educates and entertains. 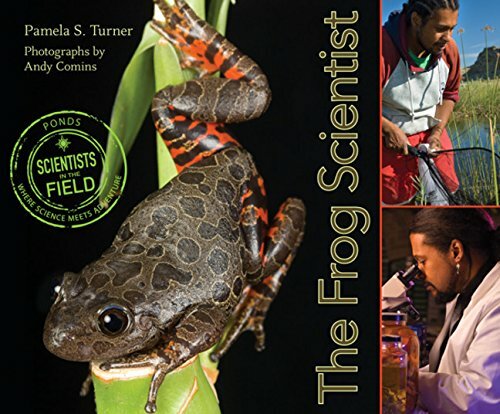 In The Frog Scientist, Ms. Turner introduces Dr. Tyrone Hayes, frog scientist extraordinaire. She opens the book by taking us along on a field trip with Dr. Hayes and his graduate students as they collect leopard frogs from a Wyoming pond. Dr. Hayes will take the frogs back to his Berkeley lab to study how the commonly used pesticide atrazine affects their development. It feels like you’re there at the pond in the cool morning air, splashing through water, squelching through mud, brushing clouds of mayflies from your face, and trying to wrangle the wily hoppers with big nets. The second chapter flashes back in time to show us how a tough little African American kid who grew up in a segregated south loved reptiles and amphibians so much that he ended up graduating from Harvard and the University of California at Berkeley, where he obtained a Ph.D. in integrative biology. That was 1989, the very year that scientists discovered that frogs were dying at an alarming rate around the world. Not long after graduation, Dr. Hayes went to work for the chemical company that makes atrazine. The firm wanted him to test the pesticide on frogs, but they didn’t like what he found. He discovered that tiny amounts of the chemical “feminized” male frogs, causing them to produce eggs in their testes instead of sperm. Obviously, they could not father future frogs. But the company wouldn’t allow Dr. Hayes to publish his findings, so he left to pursue his studies elsewhere. Ms. Turner skillfully takes the reader through the blind controlled experiment that Dr. Hayes designed to test his hypothesis that atrazine did indeed cause feminized male frogs. Her writing is clear and she makes complex scientific concepts easy to understand and accessible to readers. Profiles of Dr. Hayes’ young lab assistants at work further brighten the lively writing. The chapter titled, “The Amphibian Ark,” tells of scientists rescuing rare Central American frogs that are endangered because a deadly fungus is killing off entire species. Amphibians are a kind of environmental early-warning system, functioning much like the canaries that miners took underground with them to detect the buildup of dangerous gases. Amphibians experience the world through their highly porous skin and are very vulnerable to environmental hazards such as pesticides, polluted water, disease, and habitat loss. Atrazine is not the only substance that affects frogs. For example, medications such as estrogen and antibiotics can be found in natural water sources as well as municipal water. Treatment plants were never designed to remove chemicals and medications from our drinking water. It comes as no surprise that nearly one third of amphibians around the world are threatened or endangered. Ms. Turner’s book serves as an engaging and thought-provoking introduction to this issue and is sure to encourage discussion and further research. Spectacular color photos of numerous species of frogs, and of Dr. Hayes and his team at work in the field and in the lab further bring the story to life. These people are doing important work that potentially affects human beings as well as frogs. When real life is this dramatic and exciting, who needs fiction?